Bags of shucked perlemoen and equipment used in illegal perlemoen processing were found at the man’s house. 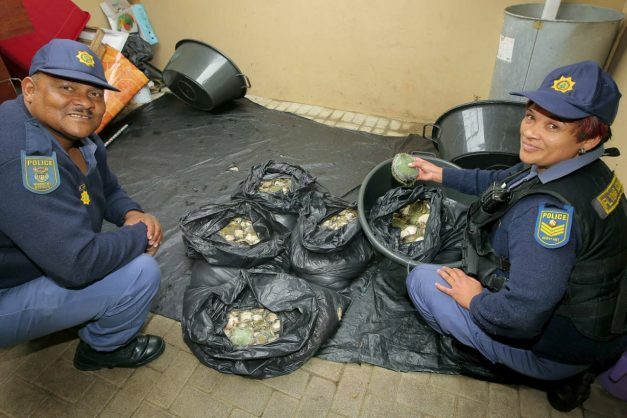 A total of 2 064 units of abalone with an estimated street value of R1 million were seized from a 45-year-old man today during an intelligence operation, Western Cape police said. Spokesperson Sergeant Noloyiso Rwexana said they were working tirelessly to close down syndicates who are stealing our maritime resources. “This morning members from the Western Cape flying squad conducting an intelligence driven operation, spotted a white Opel Corsa in De Wingerd Avenue, Burgundy Estate, and stopped it. Upon searching the vehicle, police discovered a false compartment between the back seat and built-in speakers in the boot,” Rwexana said. Rwexana said the man was arrested on charges under the Living Marine Resources Act and is expected to appear in Parow Magistrate’s Court on Friday. The Provincial Commissioner of the Western Cape Lieutenant General Khombinkosi Jula praised the members involved for their vigilance.